I decided to stretch myself and use some real joinery and make a small table. Figure eight table top connectors and screws. The boards I picked were reasonably flat, so I just smoothed one side of each with the planer and glued the two together. I squared up one end then I used a sled to edge joint one side and the sliced it into four inch and one half with legs. I cut each leg to its final length. I used and 1/4 inch straight bit and set up the fence on the router table to make open mortises. I clamped a stop block at the length I wanted. For each leg I took several passes to make the mortise to the depth 1/2 inch. I one of the legs to set the stop block to the proper distance on the other side of the fence. I did that because I was sure I was totally centered and this would keep the offset consistent. I cut the other mortises. I cut the two long skirts and two short skirts to length and rip them to width. After some tests, I cut the mortises by setting the rip fence the length of my tenons. I start at the fence, and the make passes moving away from then fence until I come to the end of the board. I flip the board and repeat the process. The fit was still too tight so I sanded the tenon until I got the fit I wanted. I determined the amount of tenon that needed cut off on the bottom. I cut them off with a hand saw and clean it up and rounded the tenon with a chisel. Now I rough cut the pieces for the top. These were twisted, so I made a crude sled so I could joint them with the planer. I propped up the high spots with shims. I sketch a pattern on the face so I could tell when the top was jointed. I flipped the boards over and planed the other side. Using the sled again, I edge jointed the pieces and glued them together. I sanded the legs and the skirts. I glued the two longer sides together. I glued the short skirts to one of the log sides. I glued the other long side to the short skirts. I squared the top and trimmed it to width. I rounded the edges of the top. I bored holes for the figure eight connectors in the skirts with the drill press. I smoothed the lacquer with #0000 steel wool. I attached the figure eight connectors to the holes in the skirts with 1/2 inch screws, drilling pilot holes. I aligned the bottom to the top. I attached it to the top with 1/2 screws, drilling pilot holes. Then I applied a coat of wax to the whole table. I thought this went pretty well considering it was my first real woodworking joinery project. Free plans are available in PDF and Sketch Up format. Just take a piece of plywood and cut it so it fits, then glue a piece of sheet metal to the top of it with some contact cement. Underneath, on the front, there is a hook made out of a couple blocks of wood. Then the guide rails on the side are tacked on to keep pieces from falling off. Not that that happens, but you never know. 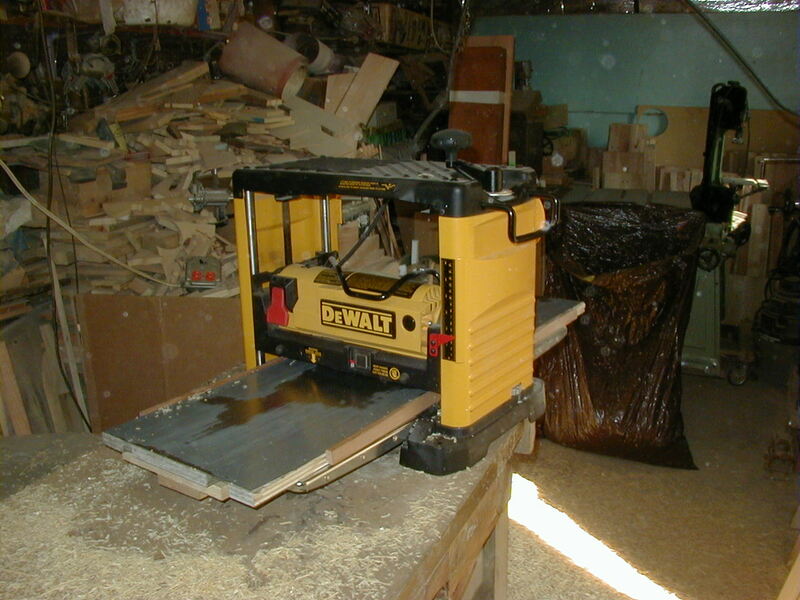 I've used my planer without the auxiliary table, and with it. I like it a lot better with the table. In fact I wouldn't use my planer without the table anymore. You'd just have to try it to see what I mean. The underside of my table has dried contact cement (J roller smooth) on it too. That keeps it from slipping around in place. It was a bit of a happy accident that is how it is. But I do like it. Someone could sell these things and make a mint. It is just that much of an improvement. Interesting. Does it help with snipe? It helps. But I just noticed a little on a piece I did recently. So I cannot say it eliminates it. I only noticed it after I'd finished the piece. That is how faint it is. I have to look at the top of that box at just the right angle to catch it at all. I vaguely recall before I used my table my planer really sniping work on me sometimes. But I've been using my table for so long now that is going back a ways for me. The best I can say is try it, you'll like it. The auxiliary table really helps when you run longer material through the planer. The piece I put a little crease in was pretty short when I planed it. So it just did not have the weight to stay down as the rollers sucked it up. It was actually a little piece of a wine box I was planing. So it was very thin too. I was making a fitted case for some dovetail milling cutters I just received. So just a shop fixture. I was still a bit annoyed that I missed that crease before I finished the piece. Not annoyed enough to take it out though. It's really not bad. Thickness planers are like magic for salvaged wood. Turns trash into treasure.